Ear pain in children is all too common. And it’s one of those horrible things that you often just can’t help them with. I’m always reluctant to resort to medicine containing paracetamol, because I know it will treat the pain but not the cause. But there’s nothing worse than seeing them hurt and not being able to do anything about it. Luckily, there are things you can do to help your children to avoid ear pain as well as using over the counter ear drops. Earex Pain Relief Ear Care Expert, Dr Henderson, has put together these healthy ear tips. ‘Swimmer’s ear’ – more correctly called otitis externa – is a condition that affects more than 1% of the UK population every year. It is given this nickname because it can often be caused by water getting into the ear canal – the tube between the outer ear and the eardrum – and so is more common in people who swim regularly. Other causes include infection and allergic reactions but it can also occur for no obvious reason. Although anyone can get it, at any age, women appear to suffer slightly more than men. As well as swimming, other factors triggering the condition include excessive ear cleaning or overuse of ear piece headphones, as well as pre-existing skin conditions such as eczema, acne or psoriasis. The general advice is to always avoid getting the affected ear wet, and resist the temptation to use cotton wool buds inside the ear or pushing a towel into them. You may also be prescribed anti-inflammatory or antibiotic ear wax drops by your doctor to treat it. Music and machinery can expose us to over the safe noise limit – 85 decibels (dB) for long periods. MP3 players in Europe have a default limit of 85 dB. As a general rule of thumb, if other people can hear your headphone music then it’s too loud! (Remember that the earbuds on MP3 players funnel the sound waves directly into the ear.) Long-term exposure to high volume levels can wear out the tiny hair cells of the inner ear over a period of time that convert sound into nerve signals that go to the brain. Take breaks if you must listen to music through earbuds, and try to use noise-reducing headphones. Don’t fall asleep with earbuds in and make sure your devices are set at 60 decibels or lower – the level of normal conversation. ‘Aeroplane ear’ is the term given to pain in the ears that occurs during take-off and landing on flights. This is due to unequal air pressure inside the ear in comparison to the atmosphere outside, due to blockage of the Eustachian tube in the ear and it can be very painful. Not equalising pressure in the ears on planes is called barotitis. This is usually more of a problem when landing than taking off. Try to chew, yawn or swallow as this helps to equalise pressure when landing. If you have to fly when you have a head cold try taking an oral decongestant before flying. Don’t let your child remain asleep during landings. And don’t worry too much if they have mild ear discomfort when landing as this is due to the pressure in your ears equalising. Ear wax is important for ear health as it helps to protect the lining of the ears. After it is produced, it slowly makes its way to the opening of the ear where it either falls out or is removed when you wash. However, too much wax can sometimes build up, causing mild hearing loss, known as conductive deafness. This means sounds can’t pass freely through the ear canal because of a blockage. Olive oil is often recommended. This is not as effective as some other drops it can soften wax prior to the ears being syringed. Earex ear drops for pain can be very effective here too. There’s an old saying – ‘Never put anything smaller than your elbow in your ear’ and it really is true! You can hurt your ears by poking around in them, even with cotton buds. These can push wax deeper in your ear or even irritate the ear canal causing an infection. Also, never put anything sharp in your ear because it can cause bleeding or serious damage. Millions of people suffer from allergies, often at their peak in spring and autumn. These usually look like as hay fever type symptoms. Household dust and pet hair are also triggers and allergies can affect your ears as well as your eyes, nose and throat. The most common symptoms affecting ears are itching, fullness, difficulty hearing and earaches. These can often be treated by over-the-counter allergy medicines, such as antihistamines and decongestants. Itching can also be eased by using ear drops. An allergic reaction can sometimes lead to a temporary loss of hearing too due to the middle ear becoming inflamed. This usually goes away when the allergy is treated. In colder weather, our ears become vulnerable to the cold because they have no protective fat tissue and so cool down quickly. There is only a thin layer of skin protecting the nerves in the ear canal, and cooler weather (along with wind) may cause discomfort in your ear canal. Covering your ears when you’re outside for longer periods of time will help keep them warm and healthy. While pierced ears are enormously common, they can be the route to putting this delicate area of the body at risk. Most often occurring issues include abscesses, allergic reactions, embedded earrings, infections, traumatic tearing and keloid scarring. To steer clear of irritations, infections and problematic ears as a result of piecing, there are some simple recommendations to follow. Choose where you go to get pierced wisely – not all places that perform piecing are created equal! Investigate where you are planning to have the procedure done and ensure cleanliness and professionalism and be sure to avoid establishments that use guns. Needles are a much more gentle method. Be diligent in following aftercare recommendations carefully. Keeping the piercings clean and clear of contamination is vital to allowing the wound to heal properly. Invest in high quality jewellery. Titanium, surgical stainless steel and gold are most suitable for new piercings and help to avoid allergic reactions and infections. Rough contact sports such as Rugby, MMA, boxing or wrestling are synonymous with Cauliflower Ear. This is a common condition amongst combat athletes that sees the skin and cartilage in the ear separated and filling with bloody fluid. If not cared for properly, the fluid hardens and the cartilage dies, leaving rock hard irregular ears. Wearing the appropriate headgear for your sport is of paramount importance to steering clear of the impact of the scrum. Players must ensure the cap is tight enough that it cannot fall off or move upon contact, but also loose enough to not put too much pressure on the ear. If the ears do fall short to a forceful impact, prompt after care is just as important and it is recommended to seek medical attention. How Can Earex Pain Relief help with ear pain? Sadly, even with the most careful preventative measures, ear pain can still happen. Luckily, help is at hand. 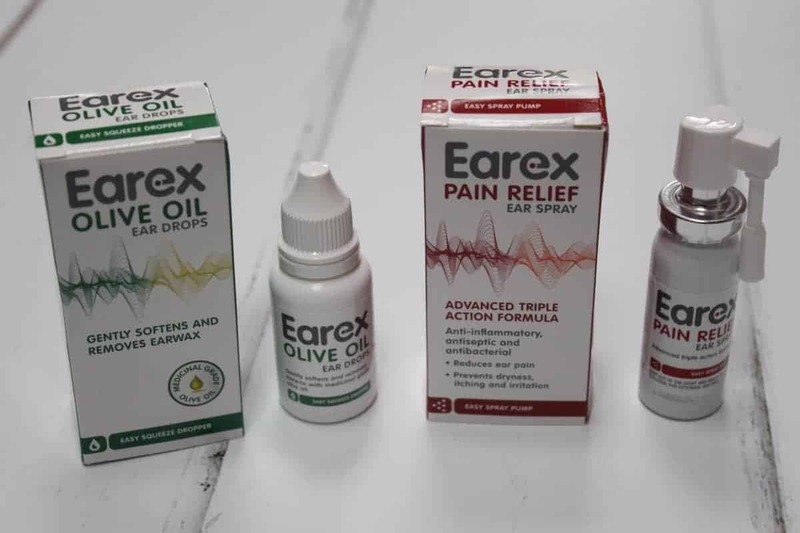 Unlike standard oral medicine, Earex olive oil ear drops and Earex pain relief spray deal with the cause of ear pain, rather than the symptoms. 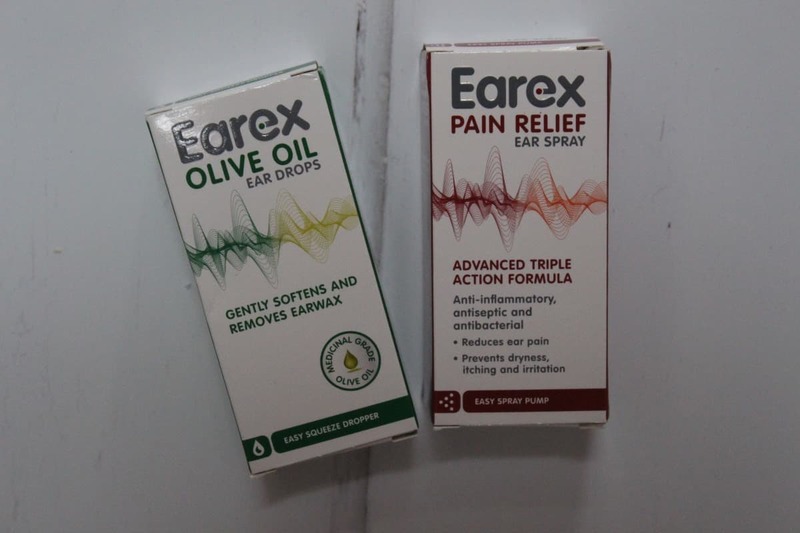 Earex olive oil ear drops are the natural way to deal with ear pain. They are easy to insert with an easy squeeze dropper and they get to work straight away. The medical grade olive oil naturally softens earwax and helps to remove the build up of it. This relieves some of the pressure that can lead to pain in the ears. The Earex pain relief ear spray is natural too, made with herbal ingredients and no steroids. It is antibacterial, antiseptic and anti-inflammatory. As well as dissolving wax and solving the immediate problem of ear pain, it can help to avoid future infections. It’s easy to use and effectively clears out the inner ear. This helps remove any earwax, trapped water, dry skin or foreign bodies that might be causing ear pain. Both me and James suffer badly with our ears. James produces too much wax and it’s literally pouring out on a daily basis. Might have to invest in some of the drops and spray for us both! Eek, I hate it when the children have earache. They’ve both had it badly in the past but Lia started to take a liking to calpol. Now we play a game where she lies to me about her ear hurting and I lie to her about giving her medicine that will help – I just use it as a reminder to give her vitamin medicine. I actually find olive oil the most effective solution when they do have earache, so the olive oil eardrops look perfect. Some great advice there thanks. With two boys ear pain and tummy upsets are a regular occurance and it’s awful to see them in pains might give this a try next time. I had no idea you’re supposed to wake children before landing in an aeroplane! We haven’t flown with M yet but I’m going to bank that fact for a future date!